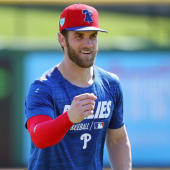 The Phillies traded Jackson to Baltimore on Thursday in exchange for international bonus pool money, Dan Connolly of The Athletic reports. Prior to be acquired by the Orioles, Jackson was selected with the 11th pick in Thursday's Rule 5 draft by Philadelphia. He spent the past year within the Dodgers' system at the Double-A level, hitting .251 with an .803 OPS, in addition to 15 home runs, 46 RBI and 22 stolen bases. He will provide a little extra middle infield depth for the Orioles, which the club desperately needs, so it shouldn't come as a significant surprise if the 25-year-old finds his way onto the Opening Day roster.